The Courtland Collection is inspired by the beautiful landscapes and rich artistic legacy of Tuscany. Its voluptuous shape, nail studded pandded leather headboard, scrolled volutes, marble tops, antiqued hardware and grand mouldings are hallmarks of the craftsmanship and artisty of fine traditional furniture. 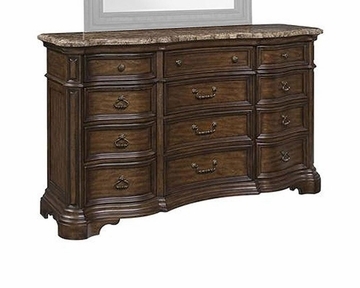 Crafted from select solids and pecan veneers the multi-step deep finish is weathered for a rustic Tuscan patina. The individuially framed drawers are of dovetail construction and feature full extension drawer guides for complete access.